These were made from an old single duvet cover that one of the G/Daughters was getting rid of. 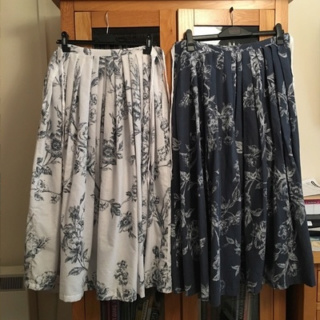 Duvet covers are great for turning into skirts because mostly each side is a reverse colouring to the other, thereby giving a two in one choice of material. They look great Sandy, congrats, you are really talented and patient . Those do look nice. You'd never guess the origin of the material either. Why I think I am enjoying sewing so much is that the material is either free or I get it for pennies. That means that I can experiment because if it goes wrong it doesn't matter as I have not wasted money. New material is so expensive now, that you really have to know what you are doing the moment you put a pair of scissors near it. Material is material whether it's from a virgin bale or from an old sheet or duvet cover. In fact the price of bedding is so cheap that even if one really wants virgin material it's far cheaper to buy a new sheet or duvet cover than go buy off the bale. Double size duvet covers or single size sheets are the perfect size for whipping up skirts like the above. Wow they look fantastic Sandy! Great job on the sewing. I used to use all sorts of material when I made the kids clothes and one could never tell what item it used to be.